You are used to living in a town where many of your peers identify as Mormon. How would you describe your religious beliefs? I consider myself deeply spiritual, but I believe organized religion is merely an opiate for the masses. What is your least favorite thing about living in Haven? Residents tend to believe things are black or white, and because of this their dreams turn to black-and-white. You clearly have a quirky fashion sense. How would you characterize it? Two words: leisure wear. So many people dress to a certain trend dismissing what’s comfortable. How do you think you’ve changed since starting college? I don’t think I’ve changed so much as finally become who I’ve always been, with no societal norms to hold me back. Discussing philosophy with close friends over truly exceptional coffee, followed by a jazz concert in the park and Vietnamese food. Thanks so much for stopping by, Zan! 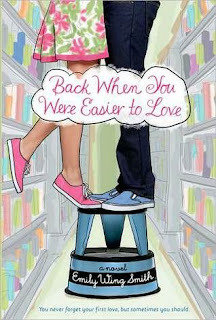 Back When You Were Easier to Love is in stores now. Be sure to stop by next Wednesday, which is when I'll have my own review posted. This book sounds so cute, plus the cover is just adorable. Looking forward to reading your review. Great interview. I agree that college often brings out who you actually are. Since school isn't as cliquey. Also, I had the typical low teenage self-esteem in high school and I really liked to like myself starting in college. Or at least appreciate myself for who I am and not wish I was someone else.